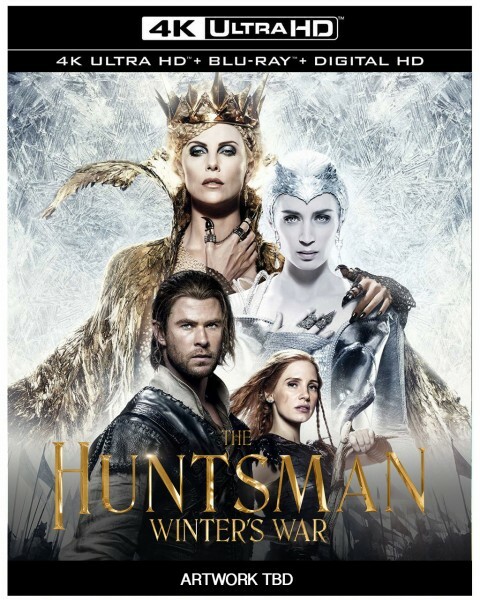 The Huntsman: Winter’s War was just released to theaters in the U.S. on April 22nd, but the Ultra HD Blu-ray (4k), Blu-ray, and DVD editions are already available to pre-order. Amazon has the disc editions priced at $36.06 (MSRP $49.99), $19.95 (MSRP $34.99), and $17.96 (MSRP $29.99), respectively. We don’t have a home media release date for ‘Winter’s War’, nor do we have any details on the 4k specs or possible bonus material included. But Universal stated their Ultra HD Blu-ray titles would include HDR-encoded video for 4k TVs that support the format, which would likely be delivered via Dolby Vision. The Huntsman: Winter’s War was directed by Cedric Nicolas-Troyan and stars Chris Hemsworth, Jessica Chastain, and Charlize Theron. The film is the sequel to the 2-time Oscar-nominated Snow White and the Huntsman (2012). Universal recently announced other titles to release to Ultra HD Blu-ray this summer, including Everest, Lucy, Lone Survivor, and the planned summer blockbuster Warcraft.